Anyone else ready to start thinking about getting students outside to explore their local environment with all this nice weather? Need an excuse to get out to the amazing new Baker Wetlands Discovery Center? This workshop might be for you! February 12th and 13th, the Kansas Association for Conservation and Environmental Education (KACEE) is putting on a short course for teachers of students Pre-K through grade 12. 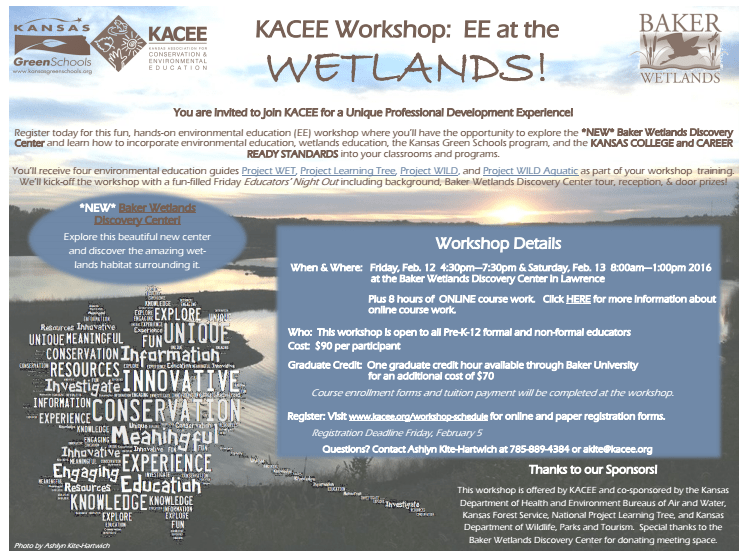 The course consists of 8 hours at Baker Wetlands and 8 hours online, and graduate credit is available through Baker University. Questions can be directed to Ashlyn Kite-Hartwich from KACEE at 785-889-4384 or akite@kacee.org. Hope to see a lot of you out there! Next Next post: Nominate an outstanding biology teacher for the KS OBTA!